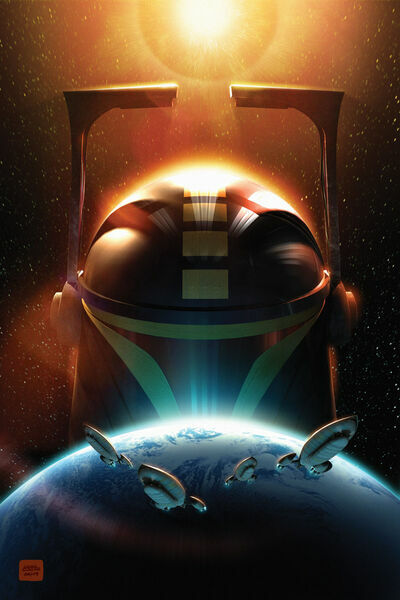 For anyone who reads comic books, looks like the Mandalorians are finally being shown in the Star Wars Legacy series. Don't know if I like the double range-finder look, but we'll see if it's just specific to this one Mando. two antennae... i assume he'll never have a bad connection on his built-in cellphone right? ba dum chi! Gee, I need to read more of these comic books. this is awesome! The two antennae do look sort of... eh, odd. Legacy, I take it this series if post-movies? I believe it's about 100+ years after Luke and the gang. I don't think they've said yet whether Cade Skywalker is Luke's grandson or great-grandson. Just that he's a descendant. Well, while there might be some advantages to having two range finders I'd have to say I don't entirely think that new look is so great. But its not horrible either, and if your going for practicality, the double range finder might be the way to go.